The simple map type reference set should be used for one-to-one mappings between SNOMED CT and alternative coding schemes. It is also possible to map to an external code system, using any of the imported terminologies or code systems as map source. 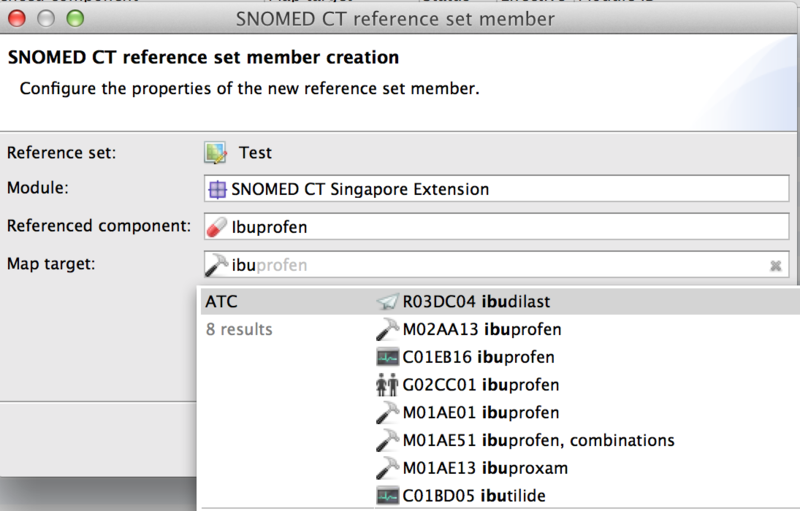 Referenced component type: SNOMED CT concept or SNOMED CT description can be used as a map source. Map target type: ATC, LOINC, SNOMED CT concept or an unspecified code system can be used as a target. To create mappings from different terminologies (e.g. ATC, LOINC) to SNOMED, please refer to the section about Mapping sets. You can set up mapping connections between SNOMED CT and the Anatomical Therapeutical Chemical Classification. The mapping reference will be both present in the SNOMED CT concept editor and the ATC concept editor. 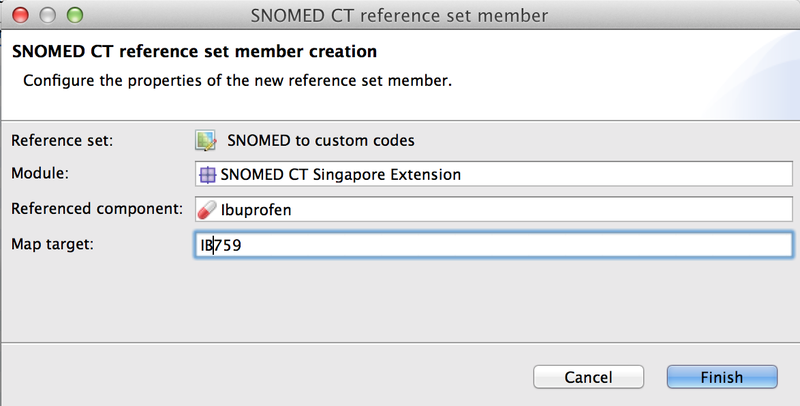 To create mappings from ATC to SNOMED CT, you need to create a simple map type reference set. Use the button in the toolbar to start the wizard. Choose SNOMED CT concept as the Referenced component, and ATC concept as Map target type. Save the reference set. It's now listed in the Reference set view. Now you can add members to the reference set. An integrated quick search facilitates the mapping. Click the Add member button in the toolbar of the reference set editor to launch the wizard. It's also possible to drag a SNOMED CT concept from the view to the reference set editor to open the wizard. Go to the text field for Referenced component and enter a search term. Select a referenced component from the list of SNOMED CT concepts. Now enter a search term for Map Target and select an ATC code from the list. Note: If you just click on the list without entering a term, all valid codes will be displayed. If you want to change the module, click into the respective text field to bring up a list with available modules. Click Finish to confirm the mapping. A reference set member ID is automatically generated. Once you have finished your work, Save the simple type map. Note: If you want to map from ATC to SNOMED, you need to create a Mapping set. 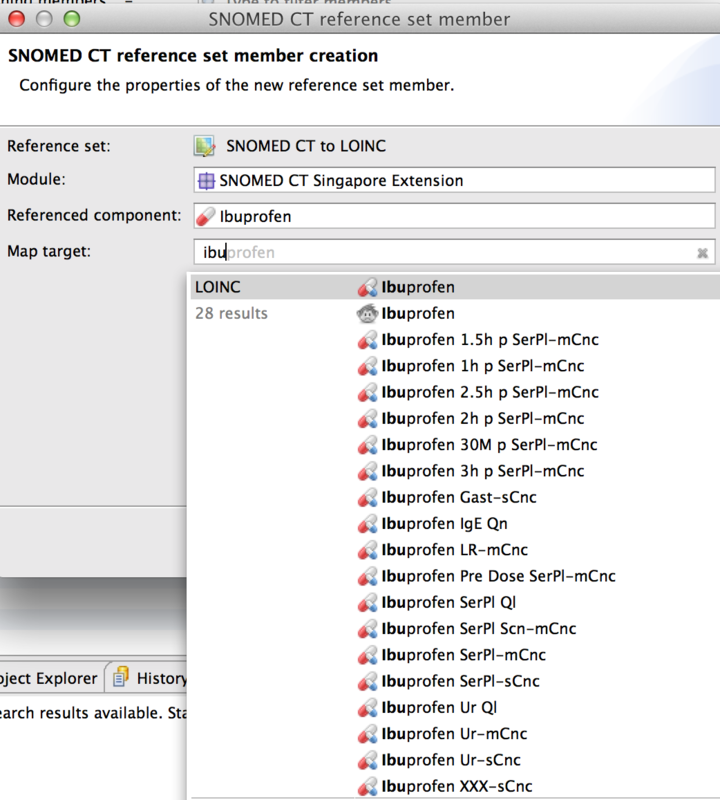 To map between SNOMED CT and LOINC, you have to create a simple type reference set. Use the button in the toolbar to create a simple type reference set. Choose SNOMED CT concept as the Referenced component, and LOINC concept as Map target type. Save the reference set. It's now listed in the Reference set view. Now enter a search term for Map Target and select an LOINC code from the list. Note: If you just click on the list without entering a term, all valid codes will be displayed. Note: If you want to map from LOINC to SNOMED, you need to create a Mapping set. You can pair the SNOMED CT with a freely entered identifier. It is not necessary for the target code system to be imported into Snow Owl. When creating the map type reference set, select'' Unspecified'' as a map target. To start the mapping, add a SNOMED CT member to the map, you can enter the map target as free text.